Tile and Grout Floor That Needs To be Cleaned! Seeing is believing. While cleaning your tile floors on a regular basis will provide you with a better overall appearance of the floor, It also provides a healthier home for your family and friends. Cleaning your tile and grout floors at least once a year will help maintain a cleaner home . Our cleaning process removes food and drink spills, cleaning residues, and fuel and oil residue from track in soiling from the garage. National Cleaning Specialist, A professional tile and grout cleaning company in the Tampa Bay area provides cleaning of tile floors for $29.95 per area up to 100 sq. ft with a two room minimum. Sealer haze: Natural stone and grout surfaces can only hold a certain amount of sealer. If excess sealer is left on the surface and it dries it could cause a smooth, silky white haze. Sealer haze on the surface of tile and stone surfaces will wear off during normal foot traffic. Sealer haze on grout lines can be cleaned using a towel soaked with fresh sealer. This will dissolve the excess and can be wiped away. In extreme conditions using a high ph tile and grout cleaner and a rotary scrubber can speed up the process of removal. 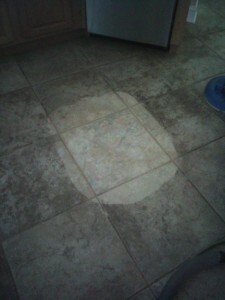 Today we are cleaning tile and grout in the St. Petersburg area. Our unique multi step Deep cleaning process removes soiling and contaminate build up from ceramic tile floors. Every job we do includes dry soil removal, Pre Treatment for soiled and stained grout, agitation to loosen and suspend soils, and a pH balancing rinse to remove cleaning solutions and soiling from the tile floors. After the process is performed a Grout Sealer is recommended to protect the grout which will help keep it cleaner and repel oil and water based stains. While using this process coupled with are High Heat Truck-Mounted equipment the floors are practically dry by the time we leave allowing you and your family to use the tile floors right away. Are you looking for Tile and Grout Cleaning? When it come to cleaning tile floors, It is important to understand what type of floor you are cleaning. Ceramic is a broad category that can include all tile that is made from clay and other non-metallic minerals.In general use, ceramic tile is used to describe tiles that don’t fall into one of the other groups. Most ceramic tile goes through a process called “firing” at high temperatures. A key advantage of ceramic tile is resistant to alkaline, acids and solvent used in cleaning. Ceramic’s abrasion resistance keeps it from being scratched by gritty soil under foot if the grade of the tile matches the situation in which its being used. Ceramic tile flooring comes in a wide variety of styles, Colors and patterns. Porcelain is high density ceramic tile made form special clays fired at high temperatures making it highly resistant to abrasion. One qualification to be called porcelain is that the tile must absorb less than .5% of its weight in water. Choosing either type of Â tile floors will give you a very durable floor which can be easily cleaned and maintained.